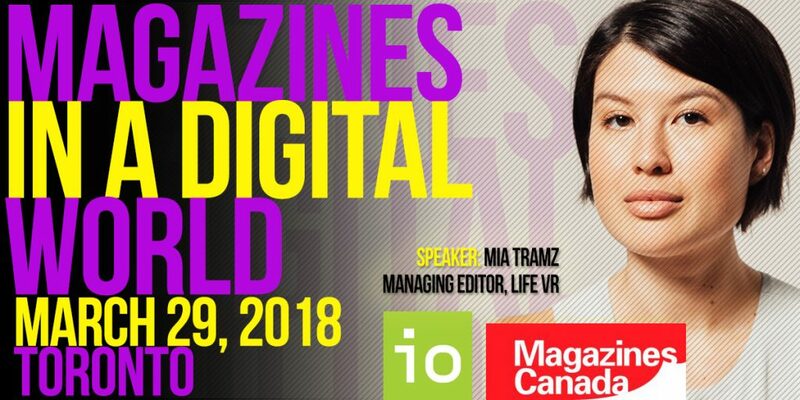 On March 29, we co-hosted a skills training and networking event called Magazines in a Digital World with Interactive Ontario, where LIFE VR’s Managing Editor Mia Tramz gave a keynote presentation on virtual reality storytelling. LIFE VR develops and produces all virtual-reality initiatives company wide at Meredith (formerly Time Inc.). Virtual reality (VR) immerses viewers in a fully artificial digital environment. The brand was named in honour of LIFE magazine, which Mia noted was always envisioned as an immersive experience, with beautiful photography and stories. 360º video: Low-level immersion; can be distributed on Facebook, YouTube and Vimeo; primarily watched on a screen rather than a headset. App: Available on iOS and Android, compatible with Cardboard headsets. The LIFE VR app is free to download and all of the content is free. The first 360º video LIFE VR produced was for TIME magazine, covering the Trump inauguration and the Women’s March. The project was completed within an ambitious timeframe of 24 hours. LIFE VR worked with GoPro and the Associated Press to meet their production time goal. Their learnings from this initial pilot project were then applied to the American total solar eclipse in August 2017. The VR experience was live-streamed on Facebook, YouTube and on the TIME website. It had 5 million concurrent views, outpacing CNN’s solar eclipse coverage, and remains the most viewed live-stream for TIME on their YouTube channel. Why? As Mia noted, TIME readers love space! She recommends that publishers first ask themselves what their readers will want from their brand on any new technology—and not start by asking what this new tech can do for the brand. She says that putting your audience first in your strategy is incredibly important when you’re investing in a new project. Defying the Nazis, a VR experience for TIME magazine, was aligned with a Ken Burns documentary and produced for a headset. It recreates a rescue mission during WWII that brought young refugees from Nazi France across the Atlantic to America. In an effort to differentiate LIFE VR from The New York Times‘ VR brand, the experience approaches a topical news story—the current refugee crisis—from a different narrative perspective, using archival images and first-hand accounts from WWII refugees. Here, Mia recommended leveraging your existing platforms to help tell the story about your VR project, to let people know where and how they can experience it. For example, for Defying the Nazis LIFE VR created a video where one of the survivors watches the VR experience. The video helps to show TIME readers how to access the experience, and why—that it is a powerful storytelling medium. Mia recommends bringing together your magazine’s existing elements for a strong project launch. Partnerships: LIFE VR discovered that movie studios were also making VR experiences as marketing for their films, and so they and the People magazine brand came on board as distributors for this film-related content. People has close relationships with the movie studios, and their readership is interested in movies and movie stars. In addition to distributing content, LIFE VR also produced an original VR experience in partnership with the film Murder on the Orient Express, creating a behind-the-scenes visit to the movie set for People On Location. Remembering Pearl Harbour is an interactive, room-scale VR experience that LIFE VR produced for TIME magazine to mark the 75th anniversary of Pearl Harbour. Created primarily for the HTC Vive headset, LIFE VR wanted the experience to be educational, historically accurate and cinematic, while also remaining sensitive to an audience of all ages. They chose not to explicitly show death so as not to traumatize or re-traumatize people. Mia notes that with projects of this scale, you need to make it worthwhile for your user to jump through the hoops that it takes to experience the content. This might mean, as with this project, making the experience cinematic in scale, or using historic advisors to ensure journalistic accuracy. 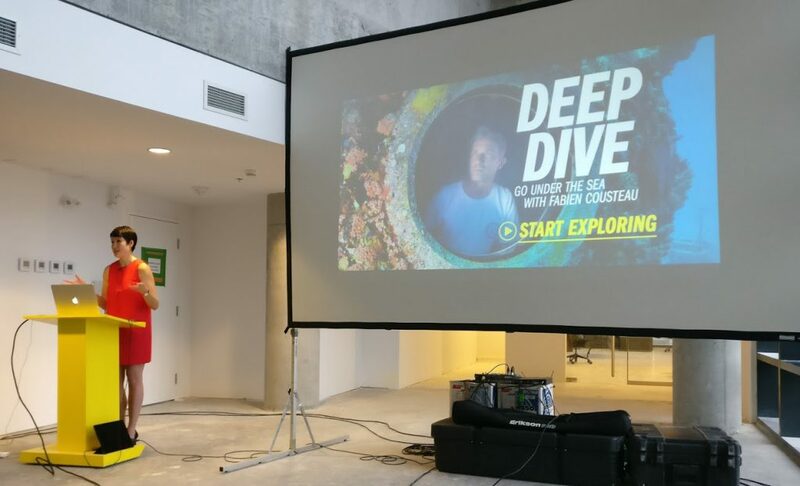 For Remembering Pearl Harbour, LIFE VR also partnered with public spaces and museums to bring the headsets and experience to people (as headsets are expensive for individuals to own). Mia says there’s an opportunity with PC-based headsets for these kinds of location-based, partnered experiences, which extend your brand out into the world and can be a viable path to creating revenue from VR. She also recommends that you consider where you are delivering your VR experience and who your audience will be when considering the length of the experience—for example, when people pay for the experience or own a headset already, 10–15 minutes is a good length of time. When it’s a public installation, you may need more people to get through the experience in a shorter time. LUMEN is a relaxation and mindfulness experience with headset-gaze interactivity. LIFE VR worked with nerve specialist Walter Greenleaf on the project, who has since incorporated LUMEN into a pilot study at a hospital. This pilot study is called Brave Heart, and includes a guided VR experience that helps children prepare for surgery. It explores whether VR can lower stress levels before surgery, and whether children will have a better hospital experience and clinical outcome. Interestingly, this study has raised new revenue opportunities for LIFE VR: after positive results in the pilot, the program may be licensed to other hospitals. Buzz Aldrin: Cycling Pathways to Mars is LIFE VR’s first holographic “archival VR” project, featuring a VR hologram of astronaut Buzz Aldrin created in partnership with tech company 8i. Best Love: a 360° music video produced for singer-songwriter Yuna and the September fashion issue of InStyle magazine. Vancouver Island: a four-episode series of 360º VR videos for Travel + Leisure about their 2017 Destination of the Year Vancouver Island; each episode was on a different topic and promoted slightly differently. Augmented Reality (AR) overlays virtual objects on the real environment. Typically AR activations have been layered onto an object in the real environment, like a magazine page or cover, but new technology can project AR images into the space around you. The Sports Illustrated “Capturing Everest” issue was the first to be AR activated, with AR content layered on the cover and throughout the issue; this included a fantasy basketball game, 360º photos and additional Everest pictures. The activation was promoted across all SI platforms, including social, with specially produced videos for Facebook. The cover AR activation was sponsored by Coors, and swiped over into a 360º video from LIFE VR’s four-chapter VR docu-series on Everest. Mia says that LIFE VR is now selling AR activation on many magazine covers as it has a lower barrier to entry than VR and so more advertisers are interested in trying it out. TIME magazine’s “Optimism” AR issue was guest edited by Bill Gates and featured an activation with Bono on the gender gap in education. The cover activation is an animated infographic about changing child mortality rates, narrated by Bill Gates. To introduce TIME readers to the technology, LIFE VR created a Facebook video prior to issue launch. There’s more information at time.com/optimism-ar. Mia recommends that AR and VR projects justify themselves, in that they should be suited to the medium (rather than any other). The technology may be new, but it is content-based, and your content is valuable to your audience. You get to decide who your audience is, and who you are producing content for. For small and new publishers, Mia notes that LIFE VR’s most expensive projects were funded by partners. She suggests that hardware companies are often good partners: they also want to get their names out there. They want people to buy their hardware (headsets, etc. ), and they want to have people experience content on them. For game-run VR experiences, Mia recommends working with game developers: there is a lot that has already been learned in this sector. Mia Tramz is the Managing Editor of LIFE VR, Meredith’s (formerly Time Inc.’s) company-wide virtual reality initiative, and TIME Special Projects Editor. Since joining TIME as an Associate Photo Editor in 2013, Mia has embraced immersive digital storytelling in many forms, culminating with her involvement shaping the editorial voice of the company’s new VR brand, developing and producing VR and AR content across the media company’s 30+ titles. LIFE VR launched as a multi-platform virtual reality brand in September 2016. Magazines in a Digital World: Virtual Reality Storytelling was hosted by Interactive Ontario and Magazines Canada and held on March 29 in Toronto at the Toronto Media Arts Centre. It was a sold-out event with 45 people in attendance from both the interactive digital media and publishing sectors. 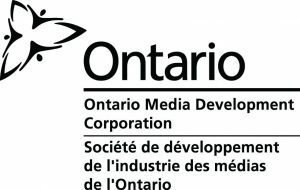 The event was made possible with the support of the Ontario Media Development Corporation.